Prefabricated shelters are useful for housing both people and equipment that need to be kept out of the elements. Their uses are nearly endless and they are beneficial for military, institutional, and educational settings. Learn more about what prefabricated shelters are and some of their most popular uses in today’s blog, below. 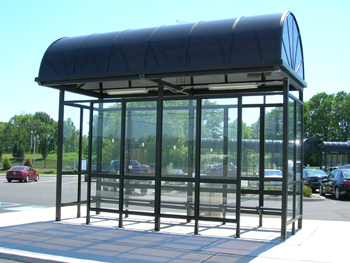 Transit waiting areas are a common use for prefabricated shelters. What is a prefabricated shelter? A shelter provides an enclosed space that offers protection for people or equipment. They consist of a frame, ceiling and roof, glazing/windows, and an entryway. At Shelters Direct, we offer prefabricated steel and aluminum shelters, both of which offer durable and rugged protection for your facility. Prefabricated can mean a variety of things, but when referring to shelters it means that the product is fabricated and assembled in our factory to ensure proper fit and form. However, the shelter is then disassembled and shipped to the customer knocked down to be assembled on site. This method aids in protecting the shelter when it is delivered to the end-user. It is also more cost-effective. Shelters can be customized with a variety of color finishes and roof designs to suit the aesthetic of the facility in which they will be installed. Ventilation space can be incorporated as needed. There are many applications in which a prefabricated shelter is beneficial. Some of the most common uses for shelters include bus waiting areas, bike shelters, equipment protection, and smoking shelters. At Shelters Direct, we’ve supplied shelters for a wide variety of institutions, including universities, governmental facilities, private users, and corporations. We have the skills and experience needed to provide the appropriate shelter for your needs and installation is a simple and hassle-free task. Shelters Direct has been a trusted source for the supplying and installation of canopies, shelters, and prefabricated booths. We work with a wide variety of clients throughout the United States and abroad to provide quality products and expert installation so you can be confident that we will get the job done right. Interested in learning more? Contact us today! And don’t forget to keep up with us on Facebook, Twitter, Google+, Pinterest, and LinkedIn too. This entry was posted on Thursday, March 3rd, 2016	at 5:11 pm	. You can follow any responses to this entry through the RSS 2.0	feed. Both comments and pings are currently closed.